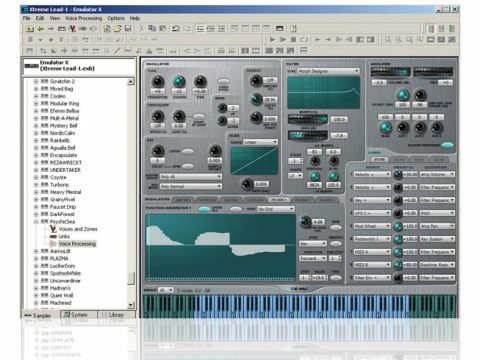 E-MU has been designing and building groundbreaking samplers for decades, and it shows in this deeply featured and highly refined software example. Xtractor can be finicky... ...as can Translator. Emulator X3 ships with some quality sounds, and it's easy to create your own. Region Xplode can blow your beats apart. E­MU almost single-handedly brought digital sampling to the masses with its Emulator series of hardware samplers, the first of which debuted in 1981. It goes without saying that the company has amassed a fair bit of knowledge and notched up a number of innovations in the three decades since. Emulator X3 is, as the name suggests, the third virtual instrument in the software-based Emulator X line, which, as we shall see, has a lot more to offer than the hardware of yesteryear. Emulator X3 carries on where its predecessor left off. This Windows-only instrument is available in both standalone and plug-in flavours. There are versions for both 32- and 64-bit operating systems, and the new Xstream engine that powers X3 is said to be optimised for both, with intelligent multicore/processor support, too. Thankfully, the company has ditched the oddball copy protection scheme that required its own MIDI interface to be connected in order to fire up the software. X3 ships with a huge selection of some of E­MU's finest sounds, including the entirety of the bank from its rather brilliant and trend-setting Xtreme Lead hardware ROMpler. There's a 1.4GB monster of a grand piano in the set, as well as a complete GM bank. Coming from the company that took full advantage of the analogue revival with its Vintage Keys module, you'd expect X3 to contain some serious vintage sounds, and these are among the most impressive patches in the bundle. There are some especially sweet Hammond Organs, complete with churning Leslie effects. Orchestral instruments are also accounted for, and there are some decent single-hit and ensemble FX included, too. If you've got Akai, SF2, Kontakt, GigaSampler or HALion patches lying about, and even EIII and ESI patches from E­-MU hardware, you can bring those in, too, courtesy of the included special version of Chicken Systems' Translator (the only limitation being that it only converts to X3 format). We had mixed results with this, depending on the formats used. Older, common formats like Akai and SF2 worked a treat. However, on the flip side, a patch translated from GigaStudio 4 crashed X3 instantly, despite appearing to have been converted successfully. Unfortunately, Kontakt 3 files aren't supported, but Kontakt 2 patches seem to work well enough. Format quirks aside, Translator enables users to avail themselves of a variety of material. Emulator X3 really comes into its own as a sound design tool, with a few features in particular warranting special attention. First off, X3 is that rarity of rarities - a sampler that actually samples from a variety of sources. Indeed, it has a full complement of features designed to eliminate the tedium normally associated with sampling. Among these is Synthswipe, a tool with which external sources (hardware or software) can be automatically sampled. X3 can even pitch and automap your recorded material - it's one of the easiest of such processes we've come across. If you insist on doing the work yourself, samples can be mapped by dragging and dropping them into the target key zones. X3 will then recognise any embedded data, such as the root note and loop points, and behave accordingly. In addition, it'll even attempt to suss out the best loop points for you. Further delights await the intrepid sample manipulator. There are the expected LFOs, envelope generators and effects processors, along with E­-MU's superb, morphing Z­Plane filters. Presets of these have been implemented in quite a few of the company's instruments over the years, but this time around, it's upped the ante somewhat, especially with the inclusion of the Morph Filter Designer, which enables the user to create custom shapes, all via a simple interface built into the filter section. The Morph Filter Designer is ridiculously easy to use and can transform a sound into something entirely different with a only few minor tweaks. New for X3 is Xtractor, a tool by which a single instrument (most obviously vocals) in a mixed piece of audio can be isolated, eliminated, processed or pitchshifted. It seems to work like a band-pass/reject filter, but with some parameters specifically designed for the manipulation of the selected instrument. We got mixed results. For instance, isolating a vocal in dense musical passages was difficult - it worked much better with sparser arrangements. Coming from the company behind the popular Beat Garden sample library, you'd expect Emulator X3 to be bursting with rhythm-centric features, and E-­MU hasn't disappointed. Firstly, TwistaLoop can now analyse and export tempo maps of an entire song, if you so desire. This will be useful for working with live musicians, and it's pretty easy to use. Simply open the Beat Analysis tool to slice up the file, adjust the resultant markers if necessary, and select Export Tempo Map. Having done so, you'll be rewarded with a MIDI file that can be dropped into your sequencer of choice. It worked very well in our tests, though we were careful to tweak our markers to perfection before exporting. The new Region Xplode beat slicer will chop up a rhythm, map the parts and export the timing as MIDI - simply drop in a loop, cut it up using the same method described above, then click over to the Voice page, where you can access the regions. After that, it's a matter of right-clicking to initiate the Xplode function. The individual hits of your loop will be neatly mapped across the keyboard as you like, and you'll also have a MIDI file correlating to the slice positions. You may never need to fire up ReCycle again. Software samplers aren't exactly thin on the ground, but none of them can claim the extensive legacy that bolsters the Emulator X3. This is a refined and powerful instrument that embodies E-­MU's considerable expertise in both sampling and sample-playback synthesis. Emulator X3 fully realises the potential of the Emulator heritage and then some. The price might be o‑f-putting at first glance, but it's not out of line with the competition, and considering the quality of the bundled content, you get serious bang for your buck.